Oftentimes, when I tell people about Freedom Boat they say that it sounds too good to be true. I get it. But there are many reasons why Freedom Boat Club, the nation’s oldest and largest boating club, continues to grow at a steady, rapid rate. We take the hassles out of boating, maintain a large fleet of late-model boats, and provide superior service. As a result, our retention rate is a remarkable 93 percent. But not all boat clubs are the same. A little research goes a long way. 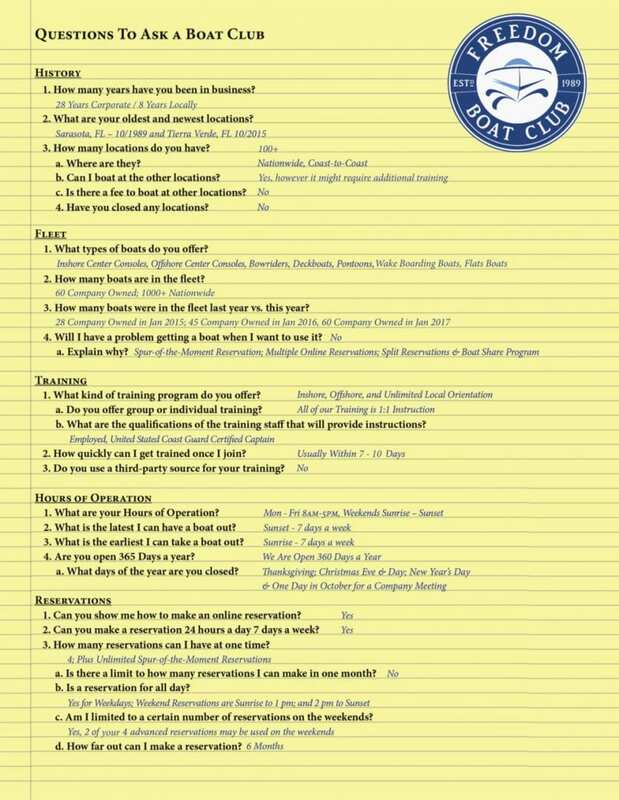 Before you join a club, be sure to ask many questions. How many years has your club been operating? When is the club closed? How many boats are in your fleet? What year, brand, and model of boats do you have? How do you reserve boats and what limitations are there? What kind of training do you offer and is training required? What happens if a boat breaks down or I get stuck on a sandbar? What extra expenses might members be required to pay? What are the membership plan options and what is included with each option? Can I get contact information for some local members to ask about their experiences? It pays to do your homework. Boating clubs are a great alternative to boat ownership but not all clubs are the same. Don’t be shy about asking questions. You’ll be glad you did.